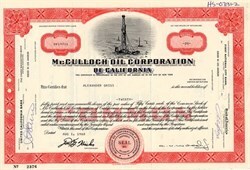 Beautiful certificate from the McCulloch Oil Corporation of California issued in 1968. This historic document was printed by Jeffries Banknote Company and has an ornate border around it with a vignette of an oil well. This item has the signatures of the Company's President, Charles Wood, Jr and Secretary and is over 38 years old. Charles Wood, Jr. was the man who had designed and engineered the construction of Disneyland in 1955. McCulloch Oil had been founded by Robert McCulloch, a close business associate of Wood. In 1960 McCulloch and Wood began to develop Lake Havasu City near Scottsdale, Arizona around a man-made geyser and the London Bridge, which had been transported across the Atlantic and reassembled. After Disneyland, Wood had gone on to build Freedomland in the Bronx, New York and to work with Toddie Lee and Angus Wynne of the Great Southwest Corporation in building Six Flags in Texas. The Great Southwest Corp., in conjunction with Webb and Knapp had gone into great debt in the early 1960s pursuing these projects and tried to recover by selling the corporate stock to the Penn Central Railroad owned by the Pennsylvania Company, which, at the same time, bought Macco Realty and Arvida. The town�s layout can be traced back to the late 1960�s, when Charles Wood Jr. was hired by Robert McCulloch of McCulloch Properties. Mr. Wood is known for his work in Anaheim, California on the design of Disneyland. He helped plan and create the design of Fountain Hills. Prior to the McCulloch ownership, this area was part of one of the largest cattle ranches in Arizona.